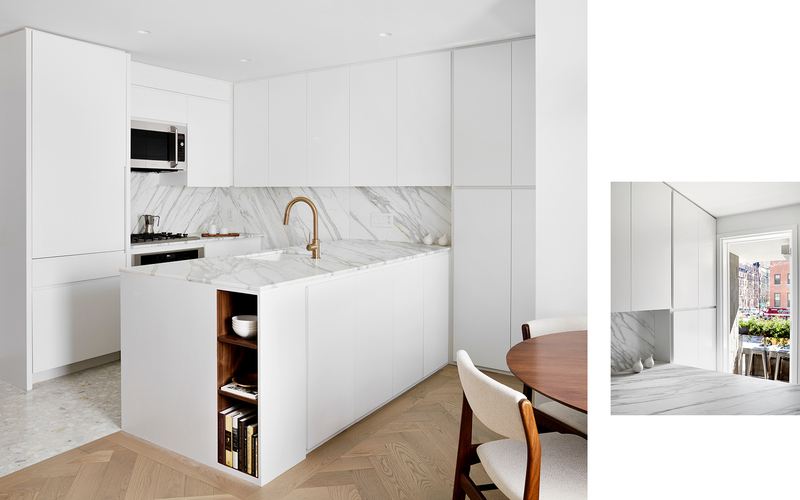 The Chelsea Pied-à-Terre Apartment is an East Coast home for a professional couple who permanently reside in Vancouver, British Columbia. Prior to the renovation, the post-war layout had a cramped enclosed kitchen isolated from the windowed living area. 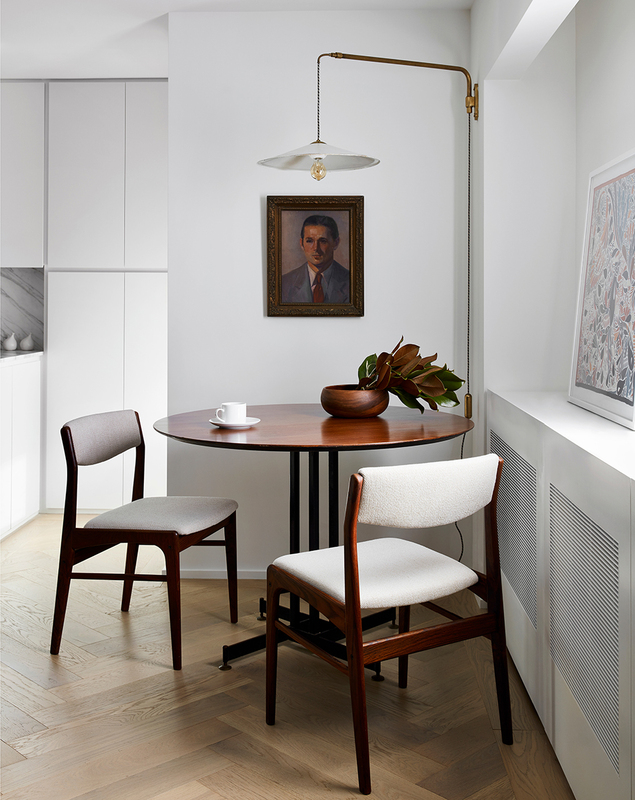 To address our client’s desire to have a robust working kitchen, we enlarged, opened, and reoriented the kitchen’s footprint to take advantage of the living room’s daylight. 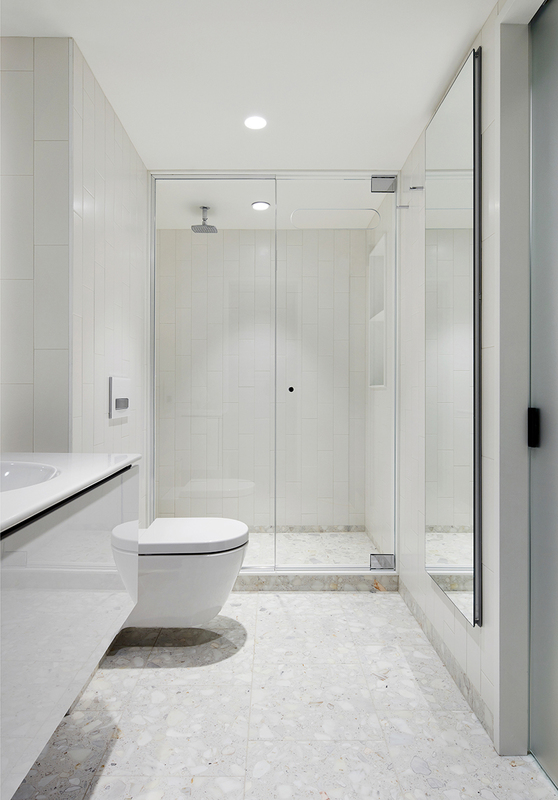 New pale oak herringbone and terrazzo large format tile floors define the living and kitchen/bathroom areas respectively. 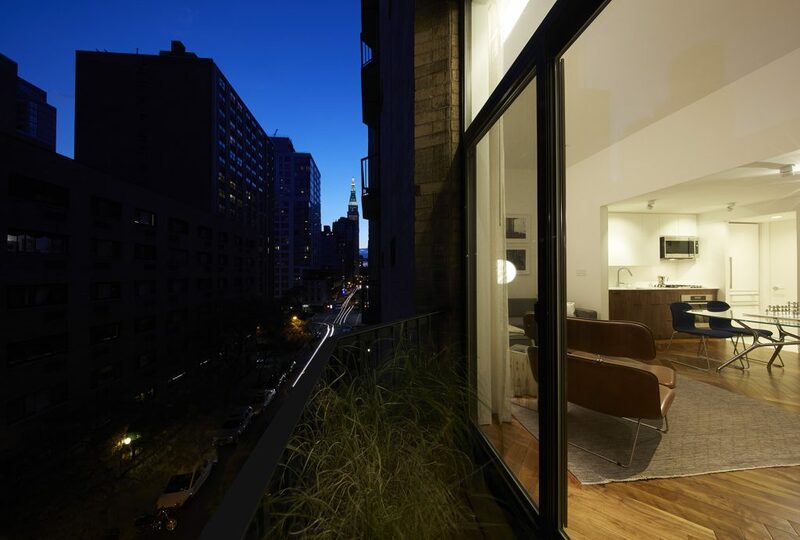 Our clients also challenged our team to incorporate a landscape feature (recalling the lush natural landscape from southwestern Canada) to help mitigate downtown Manhattan’s concrete landscape. After much consideration, we reconsidered ‘landscape’ as a custom hand painted wall covering. Canopy beds like the Great Bed of Ware by Hans Vredeman de Vries traditionally used landscape references incorporated into their design. Using this example as a precedent, our custom wall covering is analogous to the canopy bed’s use of upholstery as a space defining ceiling canopy and headboard wall. For our design, collaborated with Calico Wallpaper, the gold-leafed ceiling creates a luminous sky above the bed while the green field anchors the headboard wall. When privacy is not a concern, this room-sized architectural canopy bed becomes a visual focal point from the open living room. 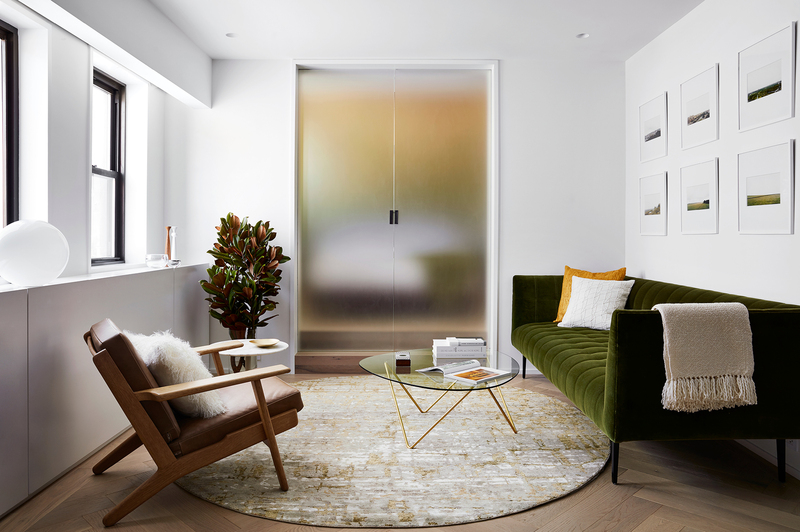 As needed, two large acid-etched glass doors close obscuring visual details while still allowing natural light to filter through the apartment’s different spaces. 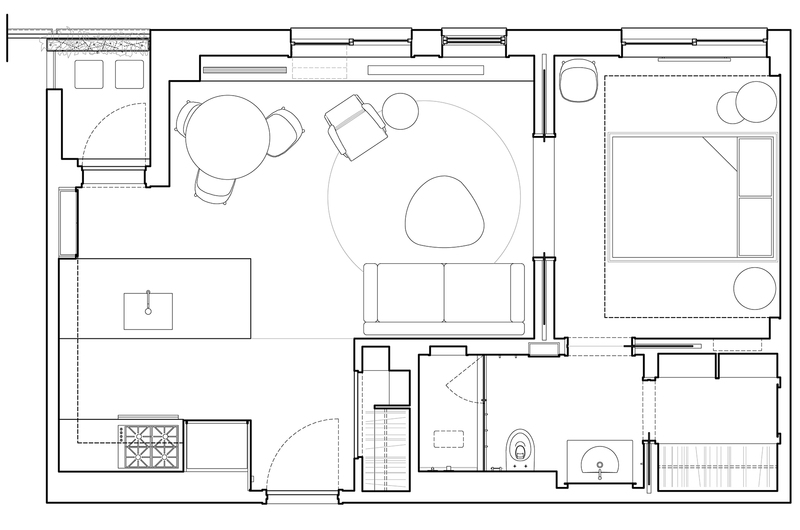 2019 American Institute of Architects – New York (AIANY) Merit Design Award Recipient, Interiors Category. January 2019. 2019 AIANY Design Awards Exhibition, Center for Architecture. April 15 – June 29, 2019. 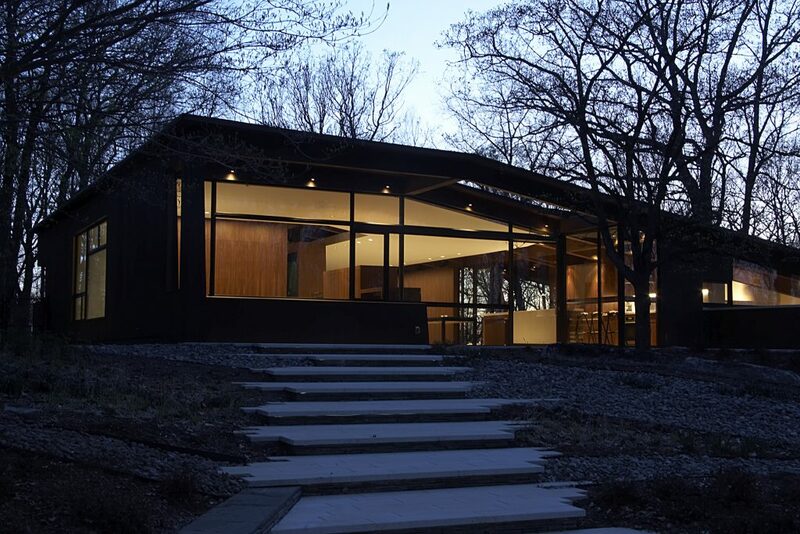 2018 American Institute of Architects – New York (AIANY) Interiors Committee Residential Review Featured Firm. September 2018. 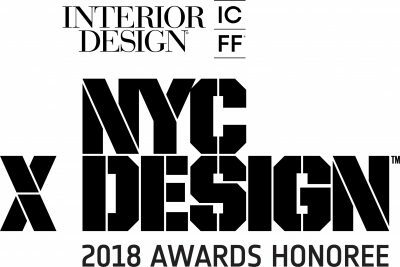 2018 INTERIOR DESIGN | ICFF NYCxDESIGN Awards HONOREE. May 2018. 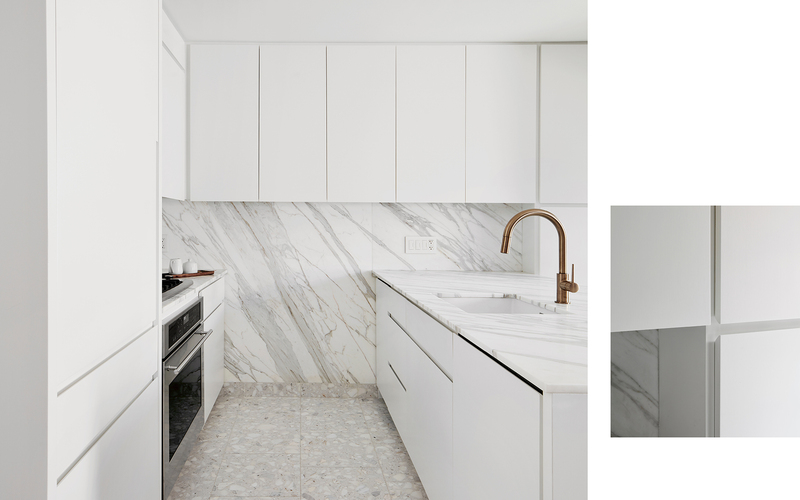 Gessato.com- “The Chelsea Pied-à-Terre Apartment.” May 2018. 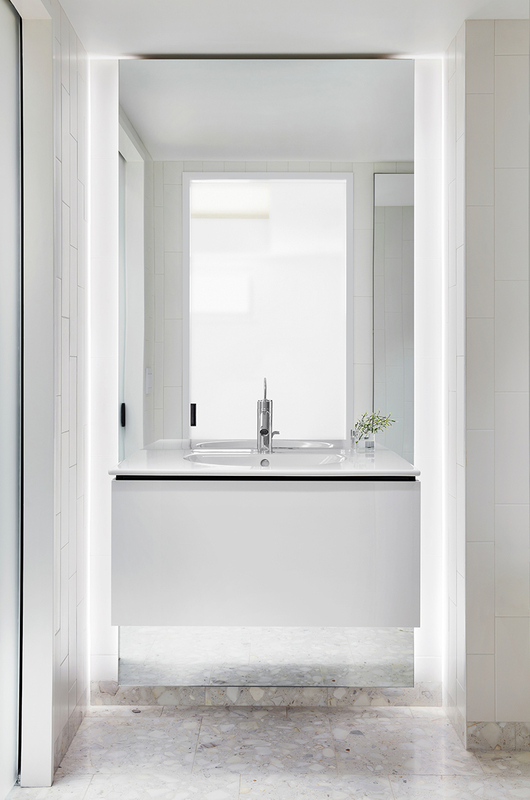 Journal du Design- “Rénovation et agencement d’un studio à New York par STADT Architecture.” May 2018. 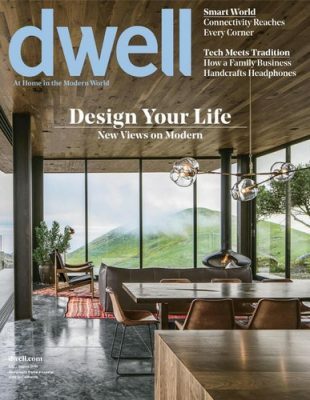 DWELL Magazine. 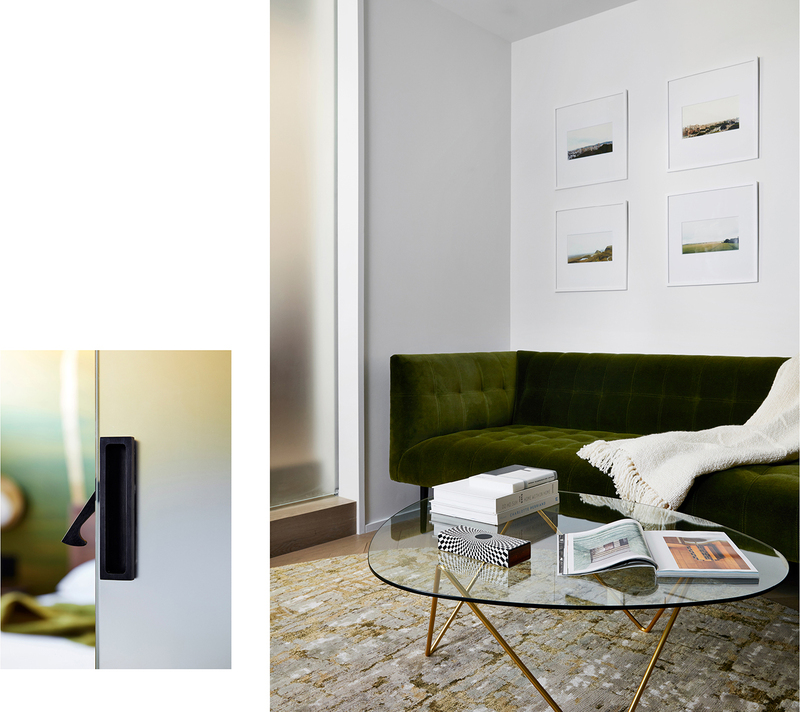 Issue – Design Your Life-New Views on Modern. “Come From Away.” Article by Tim McKeough. Pages 64-67. July/August 2018. 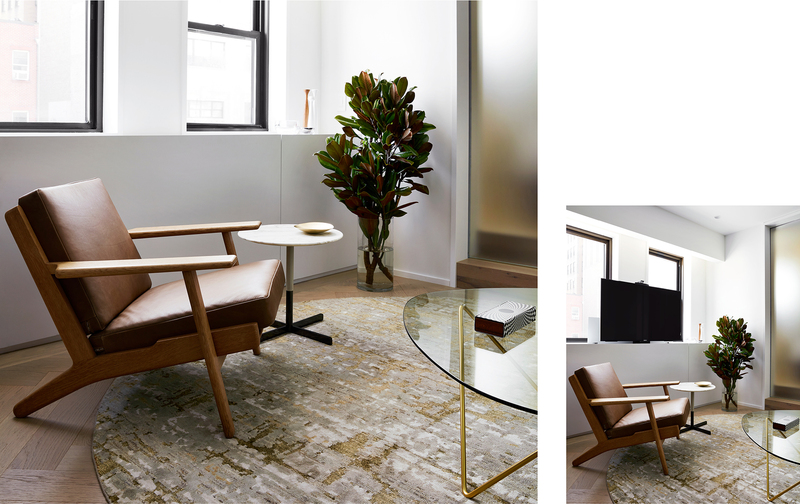 DWELL.com “A Lush Wallcovering Brings the Feeling of Nature Into This Tiny New York Apartment.” July 2018. Dezeen.com “Gold paint drips down green mural at Chelsea Pied-à-Terre by Stadt Architecture.” July 2018.